You don’t have to get surgery to look rejuvenated. We asked the experts – medical doctors in the business of beauty – what non-invasive procedures they recommend to help you look younger, longer. 1. What’s the best way to lift the cheekbones without surgery? There is one element that we are all fighting – gravity, which eventually makes our skin sag. “As we age the support structures on the face shrink, making us look tired,” says board-certified dermatologist Dr. Annie Chiu of Manhattan Beach, California. 2. What are the alternatives to eye lift surgery? Gravity and time pull the brow muscles down, especially as we frown and furrow our brows. So what can be done, short of freezing our emotions? Mount Kisco, New York cosmetic dermatologist Dr. David E. Bank recommends Botox, which relaxes facial muscle contractions and lifts that area, making it an ideal treatment for softening crow’s feet. 3. We know about the beauty of Botox, but what about the neuromodulator Dysport? 50 year old female before and one week after 50 units of Botox were injected into the area between her eyes, brow and forehead. Photos courtesy of Frank J. Ferraro, MD. 4. What’s the best way to make lips look more youthful? As we age, lines appear around the mouth for a myriad of reasons: smoking, sipping from a straw, sucking hard to get liquid from a sports water bottle, or even puckering up the lips will eventually cause wrinkles to form. Dr. Bank uses fillers, fat injections, and laser resurfacing to reduce the appearance of wrinkles, as well as light chemical peels combined with microdermabrasion. Dr. Chiu recommends Restylane Silk to fill in feathery lines around the lips and turn up drooping mouth corners. 5. What’s the best way to counteract the changes caused by aging to the face’s bone structure? Juvéderm Voluma hyaluronic acid, an injectable facial filler that temporarily restores volume to the mid-face. Photos courtesy of Allergan. 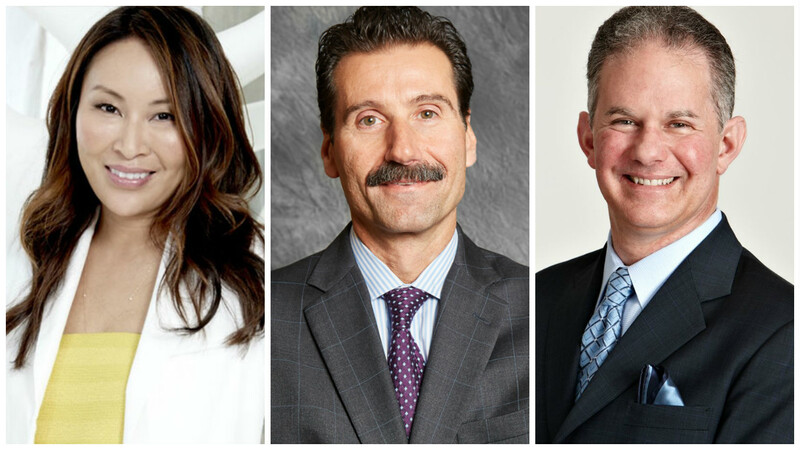 “I like to use Juvaderm, which contains lidocaine to reduce pain, or the patient’s own fat to fill in the nasolabial folds, the lips, and area around the lower lids, plus any volume lost around the nostrils,” says Dr. Ferraro. 6. Does bleaching or lengthening teeth ever help in conjunction with anti-aging treatments? 7. How can we make our hands look younger? Like the face, the hands lose volume over time, making the appearance of veins and tendons more obvious, while chronic sun exposure causes brown spots and wrinkles. In such cases, Dr. Ferraro treats his patients to great effect with lasers, topical retinoid, and fat injections. Dr. Chiu uses IPL (intense pulse light) to even out the skin’s color and improve collagen production, and replaces lost volume with either Sculptra, Restylane Lyft, or Radiesse. 8. How does facial electrical stimulation work? “Electrostimulation uses micro-currents to tighten certain muscles of the face,” says Dr. Chiu. The difficulty is that facial muscles move as a unit, and sometimes you can inadvertently recruit muscles you don’t want to strengthen. She advises to use it with caution. As an alternative, Dr. Bank recommends Thermage, which uses radiofrequency energy to heat the inner layers of the skin and rejuvenate it. 9. Can non-surgically lifting the tip of the nose help you look younger? The tip of the nose can droop with age because the bony support around it is weakened, while simultaneously, the muscle above the lip can become stronger, which pulls the nose down. 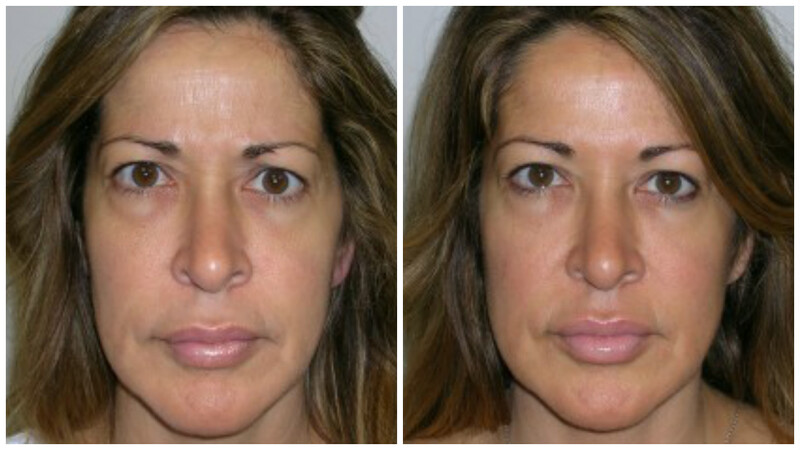 This gives the face a slightly elongated, droopy appearance, and can make the nose look disproportionally larger. Dr. Chiu treats this problem with a few drops of Dysport right into that hyperactive muscle, giving the tip a lifted appearance. 10. Besides daily skincare, what is the number one thing you can do to look younger? 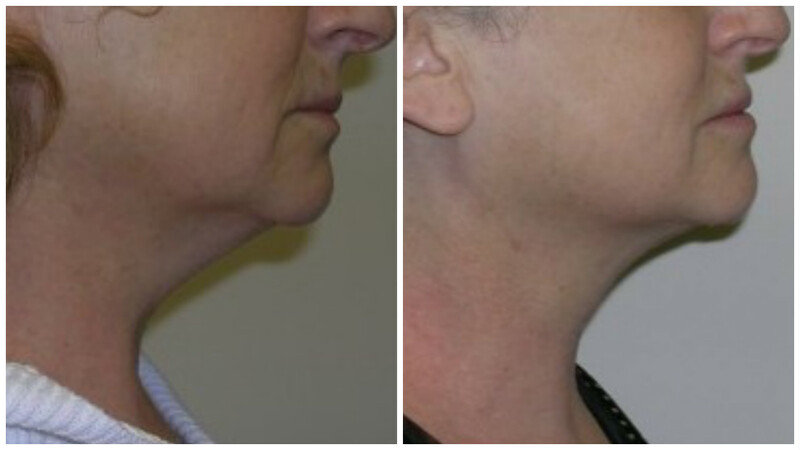 60 year old female shown before and 3 months after her second session using Kybella in the area beneath the chin. Photos courtesy of Frank J. Ferraro, MD. Bottom line: if you put yourself in an expert cosmetic dermatologist or plastic surgeon’s hands, you’ll find that time will still be on your side, even as the years fly by. Estelle Erasmus is a contributing beauty writer for Zwivel. She is also a writing coach, blogger, award-winning journalist, and former beauty editor who has been published in The Washington Post, Salon, Vox, PsychologyToday.com, and The New York Times.